Sharpen your skills with our tips and tricks. If you’re new, or even if you’re not, getting that elusive win can seem like a perilous challenge, and a frustrating one to boot. However, once you get into the swing of things by putting our tips to use, you’ll be racking up W’s in no time. Fortnite differs from other Battle Royale games in a number of ways; the ability to build bases and bridges quickly, fast-paced action and a growing selection of creative weaponry have helped catapult it into the world’s hottest trend. Becoming proficient with all the tools at your disposal is a big key to success. This is the first thing you will need to become familiar with. Unlike other Battle Royale games, Fortnite puts an emphasis on destructible cover, with just about everything, from huge apartment buildings to small chalets, being entirely destructible. So, you will need to think fast and build faster. If you hear shots coming your way, your first instinct should be to instantly build cover all around you. Trying to leg it to the nearest tree may work occasionally but more often than not, you’ll be gunned down before you make it. A quick 4×4 walled fort – or indeed the recently released Port-a-Fort if you have one handy (just don’t rely on it too much) – with a ramp to the top is a basic start and a very effective one. Be mindful of your material count and don’t be wasteful – building will need to be second nature if you hope to win games. When reacting to a gunfight, use wood first, as it builds fastest and can withstand the most initial damage. When you’re confident you’re safe and have more time to prepare, use steel or brick to provide extra fortification. 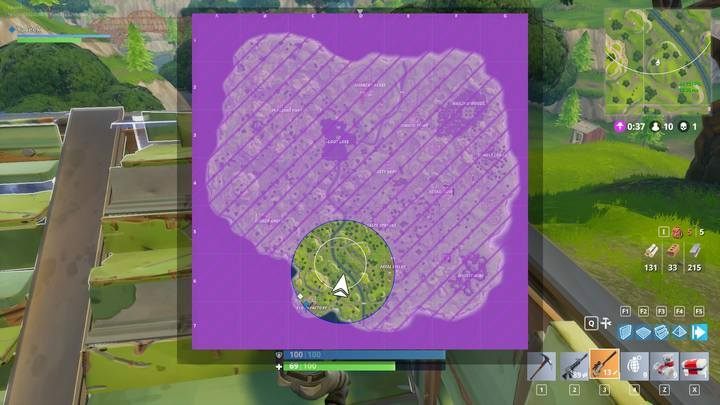 It is crucial in Fortnite to be mindful of the storm circle and plan ahead. Use your map whenever you get a moment of downtime, and make sure you have enough time to make it to the next safe zone. Each quadrant of the map will take you around 45 seconds to cross, so pay attention to how much time you will need if you are out by two or three quadrants. The speed of the storm, as well as the damage it will do, are also significant. The storm will move faster the closer it is to the circle, meaning the early circles move considerably faster than the in the later stages. However, storms in the late game will increase in damage, with the most lethal doing 7 damage a second compared to just 1 in the early circles. Once you exit the circle, don’t be naive and think there isn’t anyone behind you. People will often lurk in the circles until the very last opportunity and try to surprise you from behind. It’s easy to think that camping it out and playing passively will be your best chance at winning a game, especially when playing solo. However, if you don’t get into gunfights, you’ll never get the practice to go toe-to-toe with your rivals. While you might not get many wins to start by doing this, try landing at popular locations such as Tilted Towers which are packed full of potential engagements. It might seem tough at first, but quite literally hitting the ground running into immediate building and clashes will sharpen your skills in no time. Another useful tip as part of this strategy is to aim for the high ground, either by getting high on buildings, or building ramps above opponents. When in a gunfight, try not to move while shooting. If you are coming from other FPS games this can be a hard habit to get out of – stand still when putting bullets down range, and crouching will also help keep your bullets on target. The optimum load out will contain a variety of weapon types and ideally you will have a shotgun, a rifle (burst, AR, SCAR), a sniper and an explosive of some kind. Your fifth slot is best used for a healer; shields are best. Here are our picks for some of the best tricks to use in Fortnite: Battle Royale. Aim for the low ground as you drop, which will allow you to dive for longer before your glider is released. Avoid high trees and buildings and instead aim for low valleys. Crouching is barely audible compared to sprinting and making too much noise can give your opponents the advantage. Building is also loud, so avoid it when sneaking up on someone. Destroying buildings and items is also very loud, so think twice if you know someone is nearby. Winning Fortnite isn’t about getting the most kills, it’s about surviving. If you’re aiming for the Victory Royale, don’t engage if it’s not necessary or if it’s an unfavorable gunfight. If you see two enemies fighting, be patient and allow them to fight between themselves, then sweep in like a vulture. When playing as a duo or a squad, make sure you are all on the same page with callouts and locations, and use the compass to give effective coms. Instead of shouting “over there!”, use a number and direction, e.g. “315 North West”, this will allow your squad to hone in. Using all these tips in combination will hopefully earn you your first win or get you on a nice streak. At the very least, it will make you a better teammate when playing with friends.